Early Sunday evening is a great time to squeeze in one last cocktail for the weekend. For me, I never like to start my Mondays off in a foul, hungover mood, mainly because I’m already grumpy about it being Monday again. So Sundays I either cut myself off early, or I stick to lower alcohol cocktails, like this one. Amari are a great sub in for cocktails of the lighter ABV style (as you’ve seen in this first round here) although as I’ve mentioned before, not all are going to clock in under 40% so read your labels. This drink, written earlier this week for Serious Eats, is all about my love/hate relationship with berry season. Mainly, I can’t stand the damn seeds in berries. They pretty much ruin my enjoyment of one of my favorite types of fruit. However, being the crafty person that I am, getting around the issue of the seeds in cocktails was solved with a pretty simple berry syrup. All the flavor with none of the seeds. Smart. Combined with Cocchi Americano, this syrup gives just enough sweetness so that it’s refreshing to drink while not being too overpowering in the fruit department. Mainly, it’s balanced quite nicely. So please enjoy this late Sunday sipper while we still have long, bright evenings here in the Northern Hemisphere (sorry Australia, you get yours in December). And learn to be OK with drinking cocktails that end in -spritz and are pink. In a medium saucepan, combine raspberries, sugar, and water over medium-high heat. Mash raspberries with a wooden spoon to break up. Bring to a boil and then remove from heat. Add mint leaves and stir to combine. Cover and let stand for 30 minutes. Using a fine-mesh strainer, strain into an airtight container. Syrup keeps up to 1 month in the refrigerator. Fill a rocks glass or goblet with ice. 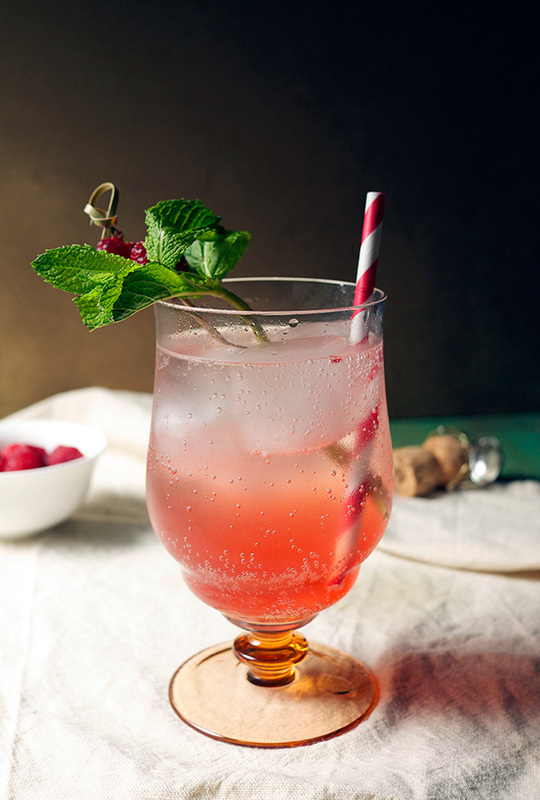 Add sparkling wine, club soda, Cocchi Americano, and Raspberry-Mint Syrup. Gently stir to combine. 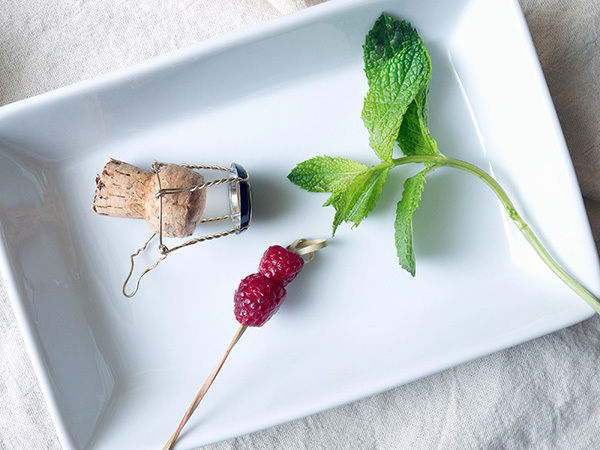 Garnish with raspberries and a sprig of mint. 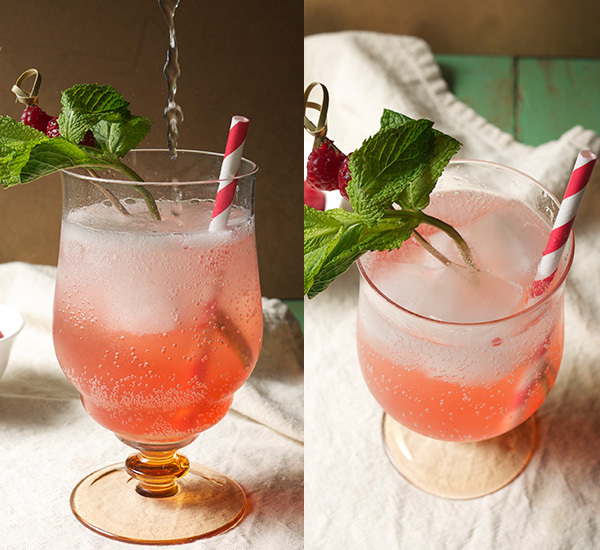 I’ve got some more of these low alcohol summer cocktails coming at you over the next few weeks so I really hope you enjoy them! As always, let me know if you’re enjoying one through the internet! It’s online all the time! Looks super refreshing, thanks for sharing! Where can I find Cocchi Americano? I suppose I could google or Amazon search, but I’m so lazy…and I just want that drink to show up on my side table right this minute! Looks absolutely delicious (and refreshing!) And don’t worry, there’s nothing wrong with enjoying something that ends in “spritz.” Any ideas for other cocktails you could use that raspberry-mint syrup with? It sounds like it has potential. He guys, I love your blog. Please also check out the blog I’m writing for: http://www.cocktailprofessor.com. Curious what you think. Cheers!